The second expansion pack for The Sims 4 is available right now! In The Sims 4 Get Together for PC and Mac you can create your own clubs, do activities together with friends and family and develop your DJ and dance skills. Windenburg is a beautiful new neighbourhood. 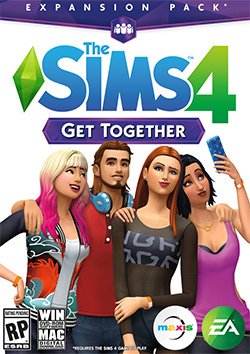 Download The Sims 4 Get Together directly below! Check out our up-to-date price overview below with trustworthy and cheap shops. This expansion pack is only available as Standard Edition for PC and Mac. Download the game as a digital download. After you bought the game, you will receive a unique legal serial key (code) which enables you to download the game. After that, you can install the game and play it directly. The advantage of digital downloads is that you don’t have to wait for post packages and above all, it is cheaper. * The listed webshops change their prices regularly. We do our very best to keep the prices up-to-date. Make sure you also check the prices yourself. Bold prices are total prices with shipping costs included (if necessary). VAT is included in total prices. Purchase The Sims 4 at your favourite shop to get a unique legal key. This key is needed to install The Sims 4. Note that DownloadSims4.com does not sell game keys itself. Prices are shown in American dollars. Prices may differ a bit in other currencies. The stores are responsible for your order. Poll: What is your favourite future expansion pack theme for The Sims 4? DownloadSims4.com welcomes you! We show you where you can download cheap Sims 4 games, including base games, Expansion Packs, Game Packs and Stuff Packs. Make sure to follow us for upcoming releases, recent releases, sale news and much more. © DownloadSims4.com. All rights reserved. This fansite is not endorsed by or affiliated with Electronic Arts or Maxis.